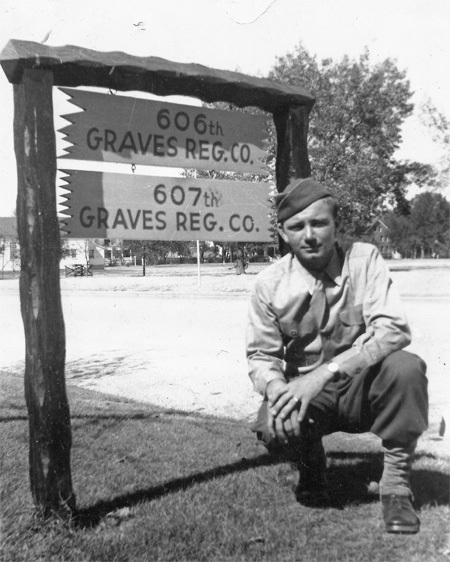 Sergeant Basil M. Cooksey, ASN 36663763 (607th QM GR Co) poses in front of the signpost designating the 607th Quartermaster Graves Registration Company and its companion unit, the 606th Quartermaster Graves Registration Company. The location of this signpost is unknown (somewhere in the ZI). Photo courtesy Cathie Beauvais & Ross Cooksey + info courtesy John D. Little. The 607th Quartermaster Graves Registration Company was officially activated 15 July 1943 at Vancouver Barracks, Vancouver, Washington (Staging Area for Seattle Port of Embarkation; acreage: 3,019; troop capacity: 250 Officers & 7,295 Enlisted Men –ed) , by authority of AG 320.2 (dated 10 May 1943), ref. OB-I SPOMU-M. The main sources from which personnel were initially obtained came from: Army Reserve Officers (2), Army of the United States (4), Regular Army (6), and Selective Service Draftees (118). 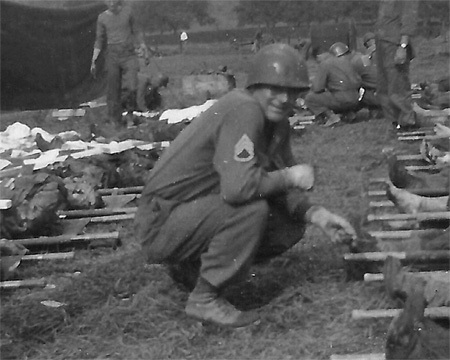 In the beginning the unit was organized under Tables of Organization & Equipment T/O & E 10-297, dated 21 January 1942 (authorized strength: 6 Officers & 129 EM). It was re-organized 23 August 1943 under T/O & E 10-297, dated 1 July 1943. Another revision was to follow with T/O & E 10-297, dated 6 November 1943 (aggregate strength: 6 Officers & 124 EM), and C-1 to T/O & E 10-297, dated 25 November 1943 (authorized strength: 6 Officers & 119 EM). Photo illustrating soldiers training at Pole Mountain Military Reservation in Wyoming. Picture taken in 1943. After receiving instructions authorized by Letter 370.5 (SPKSV) (SSD-21) emanating from Ninth Service Command, Headquarters, Presidio of San Francisco, California, the unit moved to Salem Army Air Base, Salem (Second US Army Air Force responsible for air defense of the NW Pacific coastline and support of the US Army Air Forces Training Command in WW2 –ed), Oregon by organizational vehicles on 5 August 1943. 17 September 1943, as authorized by Paragraph 2, Special Orders # 187, Headquarters Vancouver Barracks, Washington, the organization was ordered to move by rail to Fort Francis E. Warren, Cheyenne, Wyoming (Quartermaster Replacement Training Center; acreage: 94,874; troop capacity: 665 Officers & 16,518 Enlisted Men –ed) where it would remain from 19 September 1943 to 31 December 1943, for basic training and buildup. Wartime booklet introducing Fort Francis E. Warren, Quartermaster Replacement Training Center, Cheyenne, Wyoming. On 23 October 1943, the 607th QM GR Co was transferred to Pole Mountain Military Reservation, Wyoming (Target & Maneuver Reserve Area –ed), located twenty-five (25) miles from Fort Francis E. Warren, for bivouac and field training. The personnel were carried in trucks to within eight (8) miles of the bivouac area. The remainder of the march was covered on foot under simulated combat conditions, with clear weather and on good roads. The march ended 28 October end the personnel returned to Fort F. E. Warren, having marched the eight (8) miles to the entrucking point. The weather conditions were excellent. On 14 November 1943 the unit proceeded by Army convoy to Denver General Hospital and Morgue to witness and follow two post-mortems as training. The convoy left Fort Warren at 0415 hours and returned at 1900. Clear weather and good roads made movement fairly easy. On 30 November another unit convoy left Fort Warren at 0900 in the morning heading for Guernsey, Wyoming, approximately hundred (100) miles north, for extended field training. It arrived at its new destination at 1330 hours. Overall clear weather and good roads. Early December 1943 convoy practice and driving took place between 0800 and 1600 hours on 2 December, covering about ninety (90) miles. The deployment was accompanied by detection of simulated land mines and booby traps. The exercise took place under winter conditions with snow and rain. Driving alternated on macadam and dirt roads. Another motor march took place on 7 December 1943, with destination the Davis Bay Area where a bivouac was established and field exercises conducted. The distance covered was only five (5) miles. The following day, a surprise evacuation of the unit’s bivouac area was initiated which ended with the organization’s return to Guernsey, Wyoming, which it reached at 1850 hours. Heavy snowstorm and icy roads made driving difficult. Photo illustrating US Army Transport “Edmund B. Alexander” carrying the 607th Quartermaster Graves Registration Company across the Atlantic. More motor marches were held during December, with a first motor march to Torrington and Wheatland covering approximately forty (40) miles. Direction finding problems across the valley to Wheatland, Wyoming, were practiced as well, including more exercises in clear but cold weather with temperatures of 6° above zero. Traveling took place on covered macadam and dirt roads. The last motor march started at 0800, 14 December 1943, and went to Fish Canyon five (5) miles where the unit was to bivouac in the snow. Surprise evacuation and return to Guernsey took place around 2100 hours. The movement was conducted in snow, very cold weather, and icy roads. The 607th departed for Fort Francis E. Warren at 0800, 16 December 1943, reaching its destination at 1130, driving over one hundred (100) miles. The weather was clear, cold, and the roads were good. The 607th QM GR Co took part in no campaigns, battles, or military engagements during 1943, and suffered no losses. The main objective was to train and build up the unit in view of a possible movement overseas. 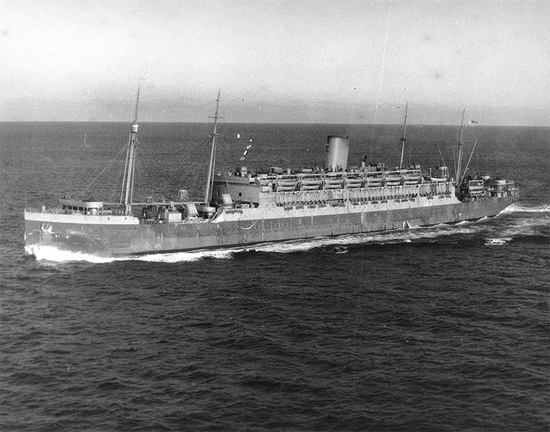 The organization sailed to England on troopship USAT “Edmund B. Alexander” (acquired by the US Army in 1940; initially used as a floating barracks at St. John, Newfoundland, in 1941; retrofitted and used as a troop transport in 1942-1943, operating between the ZI and the Mediterranean and European Theaters in 1943-1944; and carrying returning US military dependents, war brides and kids between 1946-1949 –ed) departing Boston POE on 23 March 1944 and spending thirteen (13) days rocking and rolling on the Atlantic before reaching Liverpool, United Kingdom, 3 April 1944. The ship was part of large convoy of 27 ships sailing across the Atlantic carrying thousands of troops and equipment enroute to the European Theater. The personnel were crammed deep in one of the holds, way below sea level, and slept in bunks four high. Food was served two times daily and consumed standing. The deck was grimy and slippery from the spilled food and drink, latrines overflowed, and quite a few men were seasick. Almost endlessly zigzagging its way across the ocean, the “Edmund B. Alexander” finally reached Liverpool early April of 1944. Partial view of Omaha Beach temporary Cemetery established by Third Platoon, 607th Quartermaster Graves Registration Company elements on 7 June 1944. Graves Registration and Engineer Special Brigade medical personnel are recovering and processing American and German dead along the waterline and the beach. Following its arrival in the United Kingdom, the 607th QM GR Co first spent some time in Oxford, before being stationed near Bristol, Gloucestershire, England, APO # 230, where it was to start an intensive period of training both on land as on water. In view of Operation “Overlord” the different Platoons received appropriate instructions with regard to their respective stations and training periods while in England. Movement to the respective training areas were the large-scale rehearsals were to be conducted was to take place by train or motor convoy. Different units and services were henceforth established by Headquarters, Southern Base Section, SOS, ETOUSA, with approximately 2,500 troops and over 350 vehicles being distributed over a specific area over Cornwall with different camps sites (Falmouth, Helston, Lanivet, Redruth, St. Austell, and Truro –ed) set aside for participation to Exercise “Tiger” on 28 April 1944 (the latter with tragic consequences), followed by Operations “Fabius” I to IV at Slapton Sands and Blackpool Sands, Devon, from 3 to 9 May 1944 (D-Day rehearsals already started 15 December 1943 with further exercises conducted in March, April, and May of 1944 –ed). 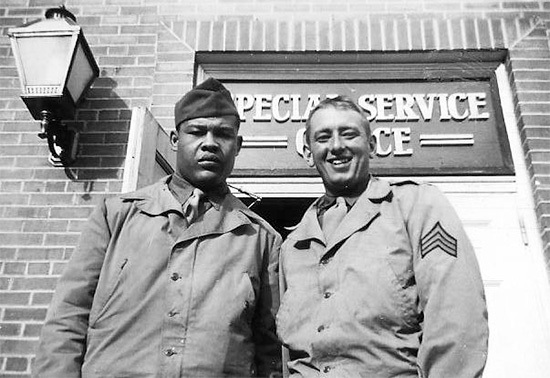 Photograph of Joe Louis (aka the Brown Bomber) and Sergeant Henry M. Robbins, ASN 33391765 (Second Platoon). Photo probably taken in the United Kingdom, which the world heavyweight champion visited in April and May 1944. Courtesy John D. Little. 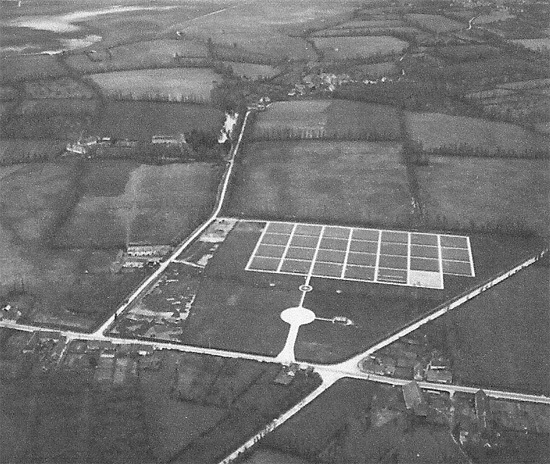 On 15 April 1944 and in compliance with First United States Army Orders, 607th Quartermaster Corps Graves Registration Company Headquarters and Fourth Platoon were sent to Knowle Camp, Bristol, England; Second Platoon to 5th Engineer Special Brigade at Swansea, Wales; First Platoon to 1st Engineer Special Brigade, at Truro, England, and Third Platoon to 6th Engineer Special Brigade, at Paignton, England. Second Platoon of the 607th arrived in St. Austell, Cornwall after an uneventful train ride. While there, the men learned that First Platoon had been sent on maneuvers (Exercise “Tiger” 22 – 30 April 1944 –ed) off the English coast and had suffered heavily during the German E-boat attack of 28 April 1944. It cost them one (1) Officer and fifteen (15) men killed, and one (1) wounded out of twenty-four (24). All men were killed while traveling aboard LST # 531 which was torpedoed and sunk during the incident. The 1st ESB suffered most heavily during this action. Total American deaths numbered 946 service men. First Platoon was therefore replaced by Fourth Platoon on 10 May while the First was then returned to Company Headquarters at Knowle Camp for replacement and training. Additional training was conducted in Swansea and in the vicinity of Oxford, England. Third Platoon was stationed at the Marshalling Area, Paignton, South Devon, designated K-5; while Fourth Platoon was temporarily stationed at the Marshalling Area, Lupton House, South Devon, designated K-6. Partial view of temporary United States Military Cemetery established at St. Laurent-sur-Mer on 8 June 1944, later to become the “Normandy American Cemetery”. Wooden markers are still in use, and would later be replaced with marble crosses and stars of David. Under the responsibility of the Commanding General, First United States Army Group (FUSAG), the elaboration of plans for care of the dead during Operation “Neptune”, the assault phase of Overlord, devolved upon the Quartermaster Section of First United States Army (FUSA) under the command of Colonel Andrew T. McNamara. The concepts in Graves Registration planning originated in the Office of the Chief Quartermaster and were subsequently translated into Standard Operating Procedures by planning agencies of the subordinate commands responsible for execution. The standard burial procedure for field operations on the continent was made in the preparation and publication on 1 October 1943 of the “Handbook for Battlefield Burials and Graves Registration by Troops” (7-page booklet with a concise summary of practices successfully applied in the Tunisian and Sicilian campaigns –ed). The Plans and Training Division, Office of the Chief Quartermaster, submitted a paper called “Preliminary Study – Graves Registration Service for Continental Operations” on 3 November 1943. Aerial view of Blosville Cemetery which held both American and enemy dead, prior to the latter’s removal to Orglandes which eventually became a dedicated German Military Cemetery. A new plan was launched on 10 January 1944, contemplating assignment of 12 Quartermaster Graves Registration Companies to the field force and 7 Companies to the Services of Supply (SOS) in the Communications Zone (ComZ). The “Handbook for Emergency Battlefield Burials and Graves Registration by Troops” was amended 1 December 1943 to reflect the SOP for operations on the continent. On 15 February 1944, the War Department approved a plan to assign 18 QM GR Companies as the ETO troop basis, with an assumed breakdown of 12 units to the field forces (3 per Army and 6 to the SOS). A revision of the troop strength for Operation “Neptune” called for a total assignment of 21 Companies (12 to the field forces and 9 to SOS). FUSA operation plans stated that 16 Platoons from 5 different Quartermaster Graves Registration Companies were to be employed during the first fourteen (14) days of Operation “Neptune”. These units would be grouped with the various assault support and reserve echelons pertaining to V, VI, and XIX Corps, all of which were to be committed during this period. The allocation of 16 QM GR Companies was to support a force of 8 Infantry Divisions – 2 Airborne Divisions – 1 Armored Division. It appears that during the period D-Day until D+6, 4 QM GR Companies – the 603d – 606th – 607th and 609th Companies, plus two Platoons of the 3041st QM GR Co were effectively assigned to the First United States Army. According to official Quartermaster Corps records for D-Day and D+1, the 603d – 606th – and the 607th (only Second + Third + Fourth Platoon –ed) QM GR Companies operated with the assault force on 6 and 7 June 1944. 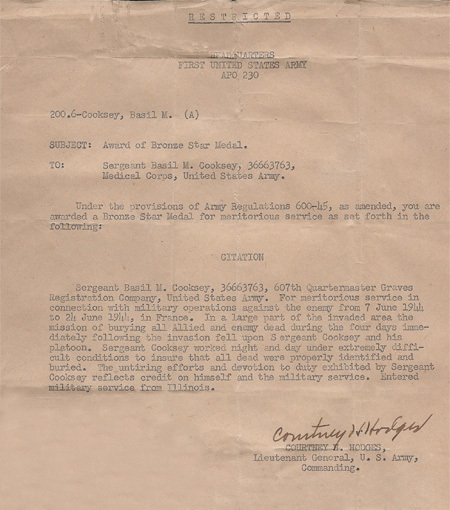 Copy of Citation for award of Bronze Star Medal to Sergeant Basil M. Cooksey, ASN 36663763, 607th Quartermaster Graves Registration Company. Courtesy Cathie Beauvais & Ross Cooksey. Following its landing in Normandy, France, 6 June 1944, the 607th Quartermaster Graves Registration Company would operate four (4) Platoons in Normandy (First Platoon was not assigned to a division due to heavy losses suffered during Exercise “Tiger”). Second Platoon was attached to the 5th ESB while Third Platoon went to the 6th ESB, both to land on Omaha Beach. Fourth Platoon was attached to the 1st Engineer Special Brigade (in fact to the 577th QM Bn –ed) which was to land on Utah Beach. The Company was thus split up with one half of its elements being assigned to Omaha and the other half being destined for Utah. The 607th boarded a Liberty Ship for the Channel crossing and after waiting off the French coast, the personnel received the order to climb down the rope ladders to the waiting landing craft which were to take them to shore. Explosions shook the barges, bodies and debris floated around in the water, incoming fire and explosions seemed to come from every direction, and everyone was very busy trying to make it alive to the French coast. At 1530 hours 6 June 1944, the first elements of the 607th Quartermaster Graves Registration Company, consisting of Third Platoon, landed on Omaha Beach, Easy Red Beach, Normandy, France. 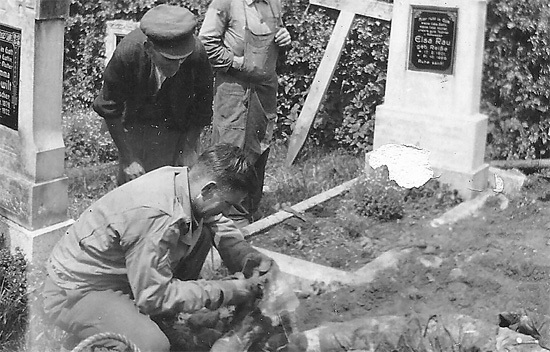 Pending arrival of Second Platoon, 607th QM GR Co (which landed at 1145, 8 June 1944 –ed), Third Platoon personnel undertook the supervision of identification and registration of graves at the cemeteries operated by the Engineer Special Brigades. At the same time, the 309th Quartermaster Railhead Company and the 3168th Quartermaster Service Company (colored personnel) were detailed to assist in the collection of bodies and digging of graves. At midnight, 9 June 1944, all bodies had been cleared from the beach area (457 dead) and the temporary cemetery was closed. Original planning called for dead to be evacuated to the cemeteries set up by Second and Third Platoon (607th QM GR Co) on D+3, located near Cricqueville-en-Bessin and Sainte-Honorine-des-Pertes. At the time plans had to be modified, since both reserved locations were still in enemy hands. Fourth Platoon which landed on Utah Beach at 1900 hours 7 June 1944, established a temporary cemetery on Utah Beach on 8 June was eventually attached to the 603d QM GR Co and cooperating with its Fourth Platoon (603d) established a cemetery dedicated to German dead at Orglandes, France, on 18 June 1944. Staff Sergeant Thomas W. Mayhew, ASN 36011948 (607th QM GR Co). Picture taken during burial operations at Fosses-la-Ville Cemetery, Belgium, some time around mid September 1944. Courtesy Cathie Beauvais & Ross Cooksey. Operations at St.-Laurent-sur-Mer Cemetery No. 1 began on 10 June 1944, when 775 Allied and 200 enemy dead were delivered for burial. Five (5) days later the 5th Engineer Special Brigade reported that all bodies had been interred and that by 2400 hours, 16 June 1944, Second and Third Platoons, 607th QM GR Co, had completed the interment of 1,510 American, 48 Allied, and 606 enemy dead with some assistance from the 606th. Labor mainly consisted of enemy Prisoners of War from a PW enclosure across the valley. While Platoons of the 607th were operating in the area, Second Platoon, 606th QM GR Co opened La Cambe Cemetery on D+4 for the 29th Infantry Division. On D+9, La Cambe was transferred from V to XIX Corps, and was now operated by Second Platoon, 608th QM GR Co, until arrival of its Headquarters and First Platoon. It should be noted that the reconstituted First Platoon and Headquarters Platoon left Knowle Camp, Bristol, at 0115 hours, 20 June 1944, for Saltram Park, Plymouth, England and only joined the other Platoons of the 607th on 29 and 30 June 1944 respectively at the St.-Laurent-sur-Mer Cemetery No. 1 (following the St-Lô breakthrough approximately 4,000 Americans, 50 Allied, and 1,500 Germans had been buried there –ed). After 356 emergency burials had been made by Fourth Platoon, 607th QM GR Co at Pouppeville (established on 8 June 1944 for the 4th Infantry Division –ed) on behalf of the 1st Engineer Special Brigade; First Platoon, 603d QM GR Co, opened another provisional cemetery at St.-Martin-de-Vareville on D+3 for the 4th Infantry Division, while Second Platoon, 603d, established one the same day at Ste-Mère-Eglise for the 9th Infantry Division. After closing the cemetery on 18 June, Fourth Platoon, 607th, was then sent to Orglandes to open the first German Military Cemetery. German dead are being unloaded at Fosses-la-Ville Cemetery, Belgium, by Graves Registration personnel (607th QM GR Co). The Cemetery was used as a last resting place for both American and enemy dead. Picture taken course of September 1944. Courtesy Cathie Beauvais & Ross Cooksey. The man standing in the trailer (with rolled up sleeves) is Private First Class John D. Little, ASN 38508482; the soldier without shirt, is Private First Class Lewis C. Farrow, ASN 39416033; while the person standing with his back to the camera (wearing a kind of 1-piece suit) is Sergeant Adolph H. Herberts, ASN 36475775, who was the Platoon Surveyor. The other people (wearing helmets) belong to another unit who brought the bodies to the collection point. Info courtesy John D. Little. Fourth Platoon sent a small detachment to Hiesville on 12 June 1944, to assist the 101st Airborne personnel with burial of German casualties, processing a total of 97 Germans before returning to St. Martin-de-Vareville. Second, Third, and Fourth Platoons were formally relieved from attachment to the respective Engineer Special Brigades on 24 June 1944, reverting to First US Army control. Fourth Platoon, 607th Quartermaster Graves Registration Company, was the only unit tasked with disinterring three (3) cemeteries during the Normandy campaign. They operated the cemetery at Utah Beach, subsequently returned to Orglandes, and eventually moved to Ste-Mère-Eglise Cemetery No. 2 between 24 and 29 June 1944. They returned to Orglandes 1 July, were then ordered to Hiesville, where they disinterred the entire cemetery between 2 and 4 July, before returning to Blosville (82d Airborne Division cemetery, approximately twenty-eight (28) miles south of Cherbourg, opened 6 Jul 44) where they removed the bodies of 401 American dead and reburied them in the new part of the cemetery. They also removed 131 German dead from Blosville and transferred them to Orglandes. Second Platoon removed the remains from the initial Omaha Beach cemetery and moved them to St. Laurent No. 1. In the course of a single week of fighting on Omaha Beach (6 > 12 Jun 44), combat losses amounted to 5,846 of which 1,225 were killed in action. The heaviest losses were 2,440 (29th Inf Div); 1,744 (1st Inf Div); and 855 (2d Inf Div). Third Platoon, 607th QM GR Co was awarded a Unit Citation for its work at Omaha Beach (WD GO 15 Sep 45). By the end of June Fourth Platoon was still operating at the German Cemetery at Orglandes. Following the American success at St-Lô, the 607th QM GR Co operated at new cemeteries located at Marigny (approx. 10 mi. west of St-Lô, opened 31 Jul 44), Le Chêne-Guérin (approx. 15 mi. south of St-Lô, opened 7 Aug 44), St. André (approx. 10 mi. southeast of Evreux, opened 24 Aug 44), and Solers (approx. 18 mi. southeast of Paris, opened 30 Aug 44), France. By 15 July 1944, Company Headquarters, First and Fourth Platoons were assisting the 603d QM GR Co at Orglandes (which they eventually took over), while Second and Third Platoons continued operating the St. Laurent-sur-Mer Cemetery. On 21 July, two Platoons of the 610th Quartermaster Graves Registration Company joined the 607th to assist in operations, and one Platoon of the 3169th Quartermaster Service Company was attached to provide labor. They received additional help on 25 July from the 971st Quartermaster Service Company which was assigned to gain experience.On 29 July 1944, Fourth Platoon was ordered to move to Ste-Mère-Eglise Cemetery (code name: Jayhawk) to take over operation from the 603d QM GR Co. Although standard GR practice was to wrap bodies in clean white shrouds (mattress covers) before burial, this was not always possible and many casualties were simply buried in the clothes they were wearing at the time they were killed, or wrapped in parachute canopies, blankets, or shelter halves. 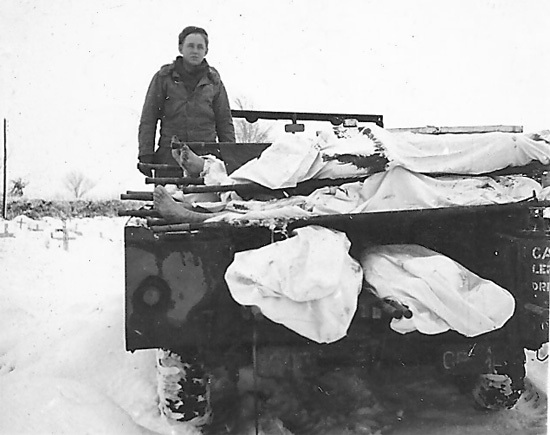 Private First Class William Tollefson, ASN 36816249, 607th Quartermaster Graves Registration Company, helps unloading bodies from an open 3/4-ton Weapons Carrier at Henri-Chapelle Cemetery, Belgium. 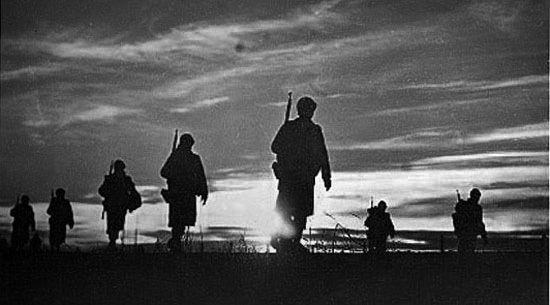 Photo taken during the winter of 1944-1945. Courtesy Cathie Beauvais & Ross Cooksey. 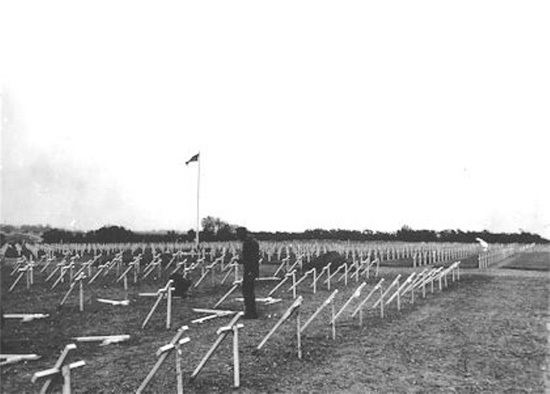 A few temporary US military cemeteries initially set up included both American and German dead, at first in mixed groups (with white wooden crosses identifying United States military personnel and black crosses for the Germans, though the latter description is hard to believe –ed), later in distinctive fields, and finally in separate cemeteries. Temporary markers were only gradually replaced by permanent crosses on 6 July 1944. During the above period operations included: collection of bodies, including identification and fingerprinting; the establishment of temporary and permanent cemeteries, interment and disinterment of dead; cemetery beautification, and general graves registration functions, under control of First United States Army. Current operations comprised the establishment of temporary cemeteries on Utah and Omaha Beach; operations at Blosville, Hiesville, and Orglandes; as well as disinterment of the temporary Utah and Omaha Beach cemeteries and the setting up of a permanent cemetery at St. Laurent-sur-Mer. On 2 August 1944, First Platoon moved to La Cambe Cemetery; the following day the Orglandes German Cemetery was turned over to ADSEC, ComZ, and Company Headquarters transferred to La Cambe. On 4 August, Fourth Platoon left Ste-Mère-Eglise Cemetery No. 2 for Marigny German Cemetery, while the 607th took over operation of La Cambe at 1500 hours. On 9 August 1944, La Cambe Cemetery was transferred to ADSEC, ComZ. On 10 August, the 607th began operating both Marigny Cemeteries with assistance from Company Headquarters and Second and Third Platoons. 14 August 1944 proved a very special and a sad day as Captain W. Pearson, assisted by First Lieutenant R. E. Berry, and 6 Enlisted Men, took charge of the body, after execution, of Private Clarence Whitfield (494th Port Battalion), a general prisoner, held at Canisy, ( court-martialed and executed by hanging –ed). On 17 August, the responsibility of operating the Marigny American and German Cemeteries was transferred to ADSEC, ComZ as of 1800 hours; Second and Fourth Platoons then moved to Le Chêne-Guérin Cemetery where they began operating at 1800. On 19 August 1944, Headquarters, First and Second Platoons moved to Gorron Cemetery where they started operations around 1800 hours, 20 August 1944. They were joined by Second and Fourth Platoon two days later. In view of a transfer of operations, the responsibility of operating Gorron was transferred to ADSEC, with First and Second Platoons moving to St. André. On 30 August, the 607th QM GR Co assumed full responsibility for the St. André American and German Cemeteries. Units involved included Headquarters as well as Third and Fourth Platoons. On 3 September 1944, Third and Fourth Platoons moved from St. André to Solers to operate the American No. 1 and German No. 2 Cemeteries. Headquarters, First and Second Platoons joined the unit at Solers on 5 September. 13 September 1944: in the wake of the advancing Allied Armies, the 607th transferred First and Second Platoons to start operating the temporary cemetery at Fosses-la-Ville, Belgium. (approx. 10 mi. southwest of Namur, opened 8 Sep 44). On 16 September, the Solers Cemetery was taken over by ADSEC, ComZ, with Headquarters, Third and Fourth Platoons moving to Fosses-la-Ville, Belgium. Fosses was turned over to ADSEC on 25 September. The next day, Third and Fourth Platoons moved to Henri-Chapelle Cemetery, Belgium. The Fosses-la-Ville American Cemetery originally contained American (Cemetery No. 1) and enemy dead (Cemetery No. 2) and was closed on 12 July 1948, after all remains had been evacuated to their respective national cemeteries. 27 September 1944, Headquarters, First and Second Platoons, 607th QM GR Co, were instructed to move from Fosses-la-Ville to the Henri-Chapelle Cemetery, Belgium. Having been continually operating and moving, the unit received a well-earned break, and was established in the rest area near the Henri-Chapelle Cemetery on 1 October 1944 (where they would remain until 15 October –ed). On 4 October, First Lieutenant William O. Davis (First Platoon) and 10 Enlisted Men went on DS to Maastricht, Holland, to establish a collection point. On 8 October, First Lieutenant Ernest J. Terry (Second Platoon) and 20 EM were sent to Overeupen, Germany, to set up crosses. Almost daily trips were made to the 2d Evacuation Hospital for the purpose of picking up bodies. The 607th assumed overall responsibility for the Henri-Chapelle Cemetery as from 8 November 1944 (approx. 18 mi. from Liège, opened 28 Sep 44), relieving the 603d QM GR Co of its responsibility of operating the cemetery. It would continue to operate Henri-Chapelle and GR collection points in Belgium and part of Germany until 1 April 1945. Up to mid November 1944, daily trips were made to the 2d and 45th Evacuation Hospitals to pick up bodies of deceased patients. More trips continued to five different Hospitals in order to pick up and evacuate the many bodies. 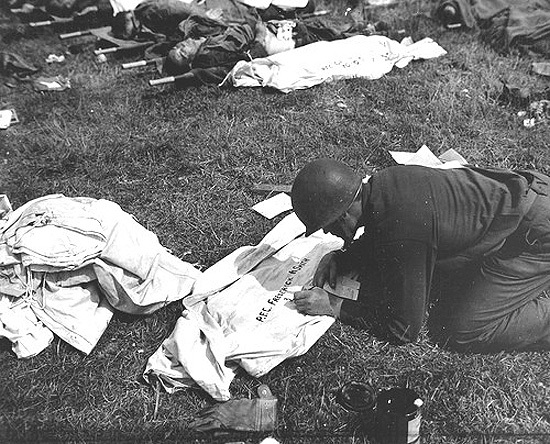 Member of Fourth Platoon, 607th Quartermaster Graves Registration Company, painting the Army Serial Number of the dead soldier onto the Medical Mattress (Cotton) Cover, Medical Department Item No. 71620. The dead man was Pfc Frederick R. Smith, ASN 33655680, C Company, 87th Chemical (Mortar) Battalion, KIA on Utah Beach, 6 June 1944. Information courtesy Brian N. Siddall. By end of November 1944, First Lieutenant Ernest J. Terry was on DS with the 3059th Quartermaster Graves Registration Company; First Lieutenant Robert E. Berry was on DS with the 3058th Quartermaster Graves Registration Company; and First Lieutenant William O. Davis was on TD with the 471st Quartermaster Group. On 14 December 1944, the latter moved on DS with the 308th Quartermaster Battalion. By end of December the current CO, Captain Whitman Pearson was on TD with ETO Headquarters, and was therefore replaced by First Lieutenant Nicholas J. Sloane, while First Lieutenant Neal F. Raker was appointed Company XO. During the German breakthrough of 16 December 1944 in the Bulge, the organization was in imminent danger of being cut off from the rear at the Henri-Chapelle Cemetery. In this period, the Company bivouac was bombed, the cemetery strafed by German aircraft as men were working on burials, and the vicinity was the scene of landing of German paratroops. Numbering four (4) Officers and one hundred and eighteen (118) men in mid-January 1945, the 607th was faced with the task of burying one of the largest groups of fatalities it had ever handled in a single month. From 17 December 1944 to 16 January 1945, 3,159 American and 1,745 German dead were buried. Remains were delivered by the hundreds each day, mainly retrieved from forward collecting points where they were evacuated to by the combat units of the First and Third United States Armies. Later in one day 405 American dead were interred, a sad unit record. In addition to its heavy workload in the Henri-Chapelle Cemetery, the 607th was called upon to supply GR personnel to the XVIII Airborne Corps and 1 Officer plus 15 Enlisted Men established various collecting points for the 82d Airborne and 30th Infantry Divisions in the thick of the fighting. It was also necessary to double interior guard and security patrols around the bivouac area to prevent any surprise enemy attack. At the time there were only 4 Officers, including two Platoon Leaders available; First Lieutenant Hugh Shackelford, Jr. and Second Lieutenant Sam Herman. A new Officer, First Lieutenant John J. McKenna, joined the 607th 31 January 1945. The 607th QM GR Co was later awarded the Meritorious Service Unit Plaque for their stand during the “Battle of the Bulge”. On 28 February 1945, unit strength was somewhat compensated by the arrival of a new QMC Officer; First Lieutenant Robert S. Coppage, and some additional Enlisted replacements. 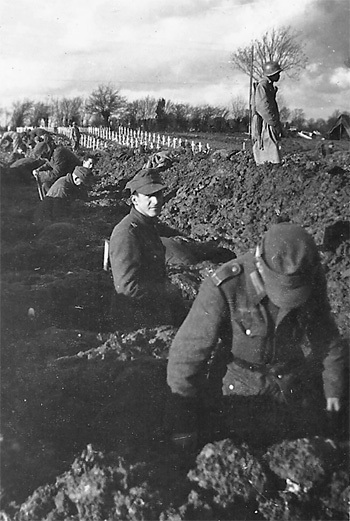 German PW labor teams are digging graves at the Henri-Chapelle Cemetery, Belgium. Photo courtesy Cathie Beauvais & Ross Cooksey. The difficulties involved in evacuating First United States Army casualties from the fighting line to Henri-Chapelle, Belgium, necessitated turning the cemetery over to the Advance Section, Communications Zone (ADSEC) and the unit eventually moved into Germany after having operated one of the largest American Military Cemeteries in World War Two for approximately five (5) months. From 1 March to 12 March 1945, 1 Officer went on DS to Stavelot, Belgium, to supervise evacuation of bodies. On 12 March, another Officer and 18 EM went on DS with V Corps to assist with the evacuation of collected bodies. On 13 March 1945, 1 Officer and 4 EM were sent to Euskirchen, Germany, to establish a collecting point. Daily trips were made to the 2d, 5th, 32d, 44th, 45th, 67th, 98th, 97th, 102d and 128th Evacuation Hospitals for purpose of picking up bodies ready for evacuation to cemeteries. Between 15 March to 31 March 1945, the total number of Enlisted replacements was 3. Many bodies which had been left as they fell because of the German counter-offensive could not be recovered until the snow started melting. A force composed of two (2) Graves Registration Platoons of the 606th and the 3060th QM GR Companies was therefore detailed to sweep the entire area. All bodies recovered were evacuated to Henri-Chapelle Cemetery still operated by the 607th. 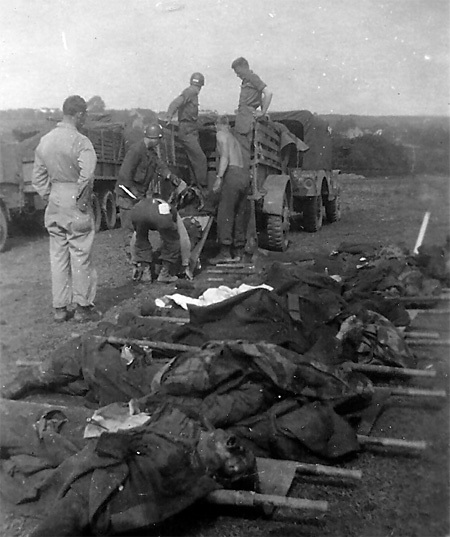 During the crossing of the Roer and the drive to the Rhine, the 607th continued to operate an Army collecting point at Euskirchen, Germany with 5 EM; a complete Platoon headed by 1 Officer was engaged in GRS on behalf of V Corps; and parties of 2 EM continued daily trips to the many Evacuation Hospitals in order to remove deceased for burial at the Henri-Chapelle Cemetery, Belgium. Although ADSEC took over Henri-Chapelle Cemetery No. 2, on 31 March 1945, (responsibility of cemetery operations and records were turned over to the 612th Quartermaster Graves Registration Company –ed) a section remained for burying German PWs, as First US Army authorities preferred to evacuate their dead to Cemetery No. 1 until expansion of the Remagen Bridgehead required an Army cemetery on German soil. On 31 March 1945, a new Officer joined and was assigned to the 607th QM GR Co; First Lieutenant John A. Liddie. This brought the number of Officers back to 6. Two American Cemeteries were established on 29 March 1945 at Ittenbach Germany. Then, owing to the expansion of the area of operations, another cemetery opened at Breuna in April. Both sites continued to operate until 20 April 1945. On 1 April, the 607th assumed the responsibility for further operations at Ittenbach. On 4 April, 4 EM were sent to Gießen, Germany, to establish a new Army collecting point. On 10 April, two Platoons were detached to help establish a cemetery at Breuna. On 18 April, Headquarters, assisted by two Platoons moved from Ittenbach to Breuna. On 23 April, Ittenbach Cemetery was closed and the two Platoons moved to Eisenach to set up a new American Cemetery. After the 607th QM GR Co took over the Third US Army Cemetery at Eisenach, Breuna was closed on 26 April 1945. Eisenach Cemetery, established and operated with the assistance of the 607th was operated by the organization from 23 April until 8 May 1945. Additional collecting points were opened at Polneck and Overfurt, Germany, which would continue to operate until V-E Day. Three Enlisted Men were employed on daily trips for the purpose of disinterring isolated burials and returning the recovered bodies to a military cemetery. Life Magazine, dated 2 April 1945, published an article on the US Military Cemetery of Henri-Chapelle, Belgium, entitled “Crosses in a Belgian field honor the men who died to win the Rhine”. Further advances into enemy territory continued and necessitated moving the Company’s collecting points. More detachments were thus moved forward to set up intermediate Army collecting points still further into the country. The experience learned in Germany pointed out the need for mobility and the ability to carry out several operations simultaneously without additional personnel. In March of 1945, the 607th QM GR Co was attached to the 579th Quartermaster Battalion (part of 534th Quartermaster Group –ed) but the unit continued to operate the Henri-Chapelle Cemetery. On 30 April 1945, First Lieutenant Neal F. Raker was on DS with the 3060th Quartermaster Graves Registration Company, and First Lieutenant Hugh Shackelford, Jr. had been appointed Company Executive Officer. In August 1945, he was replaced by First Lieutenant John J. McKenna. After V-E Day, the Eisenach Cemetery was closed and preparations were made to disinter and evacuate all American and Allied deceased to the American Cemetery No. 1 at Margraten, Holland (approx. 6 mi. east of Maastricht, opened 10 Nov 44). 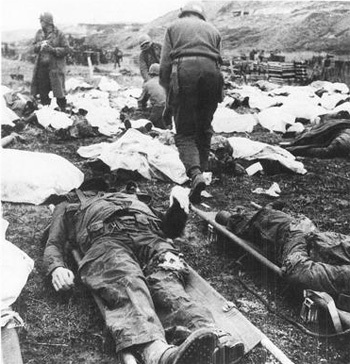 All bodies were disinterred and transported by motor convoy to Margraten for burial within approximately two (2) weeks. After completing operations at Eisenach which now served as a collecting point, the Company moved back enmasse to Breuna Cemetery where, from 9 July 1945 to 8 August 1945, 1,500 American bodies were removed and transported to Margraten, Holland, for reburial. Member of the 607th Quartermaster Graves Registration Company disinterring American dead buried in an isolated grave of a German civilian cemetery in Germany. He is assisted by locally hired civilian labor. This was part of a project attempting to recover any American dead buried in isolated, or established civilian or military cemeteries in Germany and re-inter them in liberated countries such as France, Belgium, Luxembourg, or the Netherlands. Photo courtesy Cathie Beauvais & Ross Cooksey. In August of 1945, the 607th QM GR Co was attached to Headquarters, 550th Quartermaster Group. By 25 August 1945, the 607th Quartermaster Graves Registration Company had a new Executive Officer: First Lieutenant John J. McKenna. The last ‘job’ conducted by the 607th was to sweep for isolated burials in a specific area designated by the Office of the Quartermaster, Seventh United States Army, and in beautifying the American Cemetery at Breuna, Germany. End November of 1945, the 1st Quartermaster Group issued a long list of Enlisted Men relieved of assignment and who were to be transferred in grade to the 793d Field Artillery Battalion (8-in howitzers –ed), as per VOCG Seventh United States Army, dated 7 November 1945, for return to the ZI. The unit arrived at Boston POE on 16 December 1945. The 793d Fld Arty Bn was subsequently inactivated at Camp Myles Standish, Boston, Massachusetts, on 17 December 1945. Quite a number of these men had initially served with the 607th QM GR Company, the 1st QM Group, the 46th QM GR Company, the 48th QM GR Company, the 608th QM GR Company, the 3046th QM GR Company, and the 3049th QM GR Company. 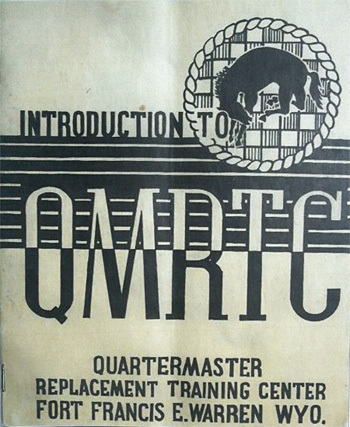 By the end of March 1945, both the 607th and 608th QM GR Companies were attached to the 6th Quartermaster Transportation Battalion, part of Twelfth Army Group. In August 1945, the 607 QM GR Co was attached to Headquarters, 550th Quartermaster Group, APO # 758, United States Army, Germany. The top priority for the GR Companies was finding isolated graves as well as unburied remains and interring the dead in one of the US Military Cemeteries. Graves of American military personnel buried in established civilian or military cemeteries in Germany were also investigated. Priority was given in evacuating the estimated 8,000 American dead buried in Germany. General Dwight D. Eisenhower had given instructions to disinter and recover the dead in order that they be re-interred in liberated countries! Together with other Graves Registration units, the 607th QM GR Co became one of the follow-on Graves Registration organizations tasked with sweeping uncovered areas and relieving forward units of the operation of established US Military Cemeteries. We are truly indebted to the late Lynn McNulty and Warren Hower (President, The Hower Research Group) for having provided us with copies of some vintage reports covering the 1943-1944 history of the 607th QM GR Co which no doubt helped us edit this concise Unit History. We must also express our sincere thanks to Cathie Beauvais and Ross Cooksey, son of Sergeant Basil M. Cooksey (ASN:36663763) 607th QM GR Co, for allowing us to use some of the pictures illustrating the unit at work in the European Theater. Additional thanks go to Brian N. Siddall who kindly offered some copies of 1944 monthly reports to complete the current unit history. Stephen Benton, son of Technician 4th Grade Stephen M. Benton (ASN:18171503) offered a partial list of personnel relating to the unit. Additional thanks must further go to Tom Little, son of Private First Class John D. Little (ASN:38508482) who was a member of the 607th QM GR Co in World War Two, and continued to serve Uncle Sam in Korea and Vietnam. The MRC Staff are still looking for additional data covering the unit’s deployment to the United Kingdom and a complete personnel roster. Thank you all. This page was printed from the WW2 US Medical Research Centre on 26th April 2019 at 02:43. Copyright 2007-2019 WW2 US Medical Research Centre. All Rights Reserved.